D's birthday falls on Passover this year, which means I can't get away with thrice-a-day matza brei as our only sustenance. For the first time in a long time, I will be cooking a meal on Passover in actual, non-disposable pans, and serving food to actual friends on actual plates. This small feat makes me feel like an actual grown-up. What that says about me, or the holiday, or both, is a conversation for another day. For now, we need to talk about our menus. Were my birthday on Passover - and seriously, I love food too much for that to be the case, so phew for February birthdays - I'd probably want a big Greek salad, a plate full of avocado in different preparations, and a dessert made with no small quantity of egg yolks, cream, and chocolate. But this is D; not much of a dessert person, undying lover of meat. We'll be having brisket. Our brisket is from KOL Foods, a purveyor of sustainable, grass-fed beef that also is kosher. The brisket's flavor is good enough -- and, considering the astronomical cost, rare enough in our house -- that I'm taking a minimalist's approach to cooking it. Instead of my usual pomegranate molasses recipe, I've settled on the famed approach of Nach Waxman. It's deceivingly simple: onions, tomato paste, and one carrot. But in my experience, no recipe celebrates the flavor of brisket more than his. As for the rest of the meal, I'm planning to slow-roast a mess of red onions until they become sweet and soft. I'll also make a carrot kugel, because kugel is D's favorite, and it's her day. But the brisket can't last forever (at least, not this brisket), and chocolate pudding/mousse/ice cream only gets us so far. Many of our other meals are likely to include a heaping scoop of this pâté. It's pictured here with sourdough. Of course, it's better on sourdough; everything's better on sourdough. But if matzah is your cracker (it's not bread, people), this pâté will make it taste like something, something delicious. The method is simple: broil a mess of eggplant slices and a whole bulb of garlic. If you've got a food processor, you'll puree those with a bunch of ground walnuts, some raisins and capers, and a hit of cinnamon. If you don't, some patient knife work will yield a lovely caponata-style spread, which is less shmearable but, on the bright side, lets each component shine more independently. Either way, on a holiday where hummus and peanut butter and bread (sob) are not on the menu, this does a lot to compensate. These pina colada-flavored macaroons are good. Not in a relative sense - I'd eat them not on Passover. 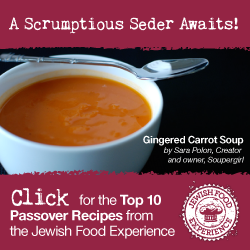 Carrot kugel is an essential part of our Passover diet. Good weeknight supper? These twice-baked sweet potatoes should fit the bill. If you must make cookies, these chocolate ones are a great choice. Plenty of other ideas here. Deb's mushroom pâté looks awesome. Passover desserts need not contain matzah/coconut/almond flour. I'll be making this flan at some point. This Persian-inspired frittata looks like a fantastic addition to my Passover lunch-for-company menu. For a show-stopper main dish at a vegetarian meal, this gorgeous cauliflower is my choice. However you celebrate, whatever you celebrate, have a wonderful weekend. Set a rack about 4-6 inches away from the broiler in your oven and preheat the broiler. Trim eggplants and slice 1/2-inch thick. Drizzle 1 tablespoon olive oil onto an unlined baking sheet; sprinkle a pinch or two of salt over the oil. Place eggplant slices in a single layer on the sheet (if they don’t all fit, you’ll broil them in batches). Drizzle a bit more of the oil and sprinkle salt onto the tops of each slice. Broil for about 5 minutes, moving pan around under the broiler to ensure that slices brown evenly. Turn slices and broil another 4-5 minutes, until nicely browned. Transfer to a plate, layering slices on top of each other. Repeat with remaining slices. When all eggplant has been broiled and piled into the plate, cover the plate with plastic wrap and let sit for at least 15 minutes, and as long as overnight. Eggplant will steam and soften as it cools. Place whole garlic bulb under broiler (on the same pan as the eggplant, if there’s room) and broil for 10-12 minutes, until skin has blackened and garlic is soft. Tuck garlic bulb onto the plate with the eggplant and let it steam-cool as well. Meanwhile, place raisins in a bowl with the honey and 2 tablespoons of water. Let them plump up while the eggplant and garlic cool. Place walnuts into the bowl of a food processor fitted with the blade attachment, and grind until the texture resembles bread crumbs. Squeeze the contents of the broiled garlic bulb into the bowl, along with the eggplant, the raisins and their liquid, the capers (if using), the remaining tablespoon of olive oil, the cinnamon, and 2 tablespoons of the lemon juice. Pulse until eggplant has broken up, then blend until mostly smooth. Taste; add salt, pepper, and more lemon juice as needed. 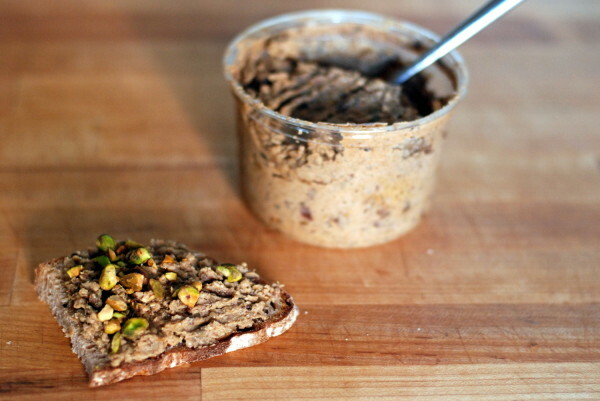 Serve cold or at room temperature, with a drizzle of olive oil and maybe a few chopped pistachios on top.